BabyBell Hosted Telecom Services | Inter-Tel Japan, Inc.
Japan's dynamic telecommunications infrastructure continues to offer a wide range of new technologies that promise increased operating efficiency at reduced rates. Consolidations of domestic and international carriers, new high-capacity fixed and wireless services, and the growing popularity of IP telephony are just a few of the changes sweeping the industry. For smaller companies and branch offices without an upscale PBX and expensive in-house IT staff, however, understanding and successfully adopting these new technologies in an economically sensible manner can be a daunting task. BabyBell consolidates your company's internal, domestic, and international voice/data communications into one easy to use bilingual, IP network service. The perfect low-cost, high-end solution for companies with highly mobile staff and domestic or international branch offices who need to be transparently unified on a global scale. A wonderfully simple bilingual user interface puts the power of Inter-Tel's advanced telecommunication technology at your fingertips. BabyBell connects our small footprint SIP phones, PC soft phones or BabyBell analog adapters* to your existing LAN. Users can easily access domestic, international, and IP extension lines at the press of a button. There is no need for a separate PBX or expensive IT support as all the necessary hardware and software functions are contained in the IP Phone+ and are maintained at our secure switching facility. Unlike conventional PBX systems which can take up to six weeks to install, Inter-Tel has a "Five and Alive" guarantee that your Baby Bell is up and running in five days from the time your order is processed. With Baby Bell you choose (and pay for) only the features you require, making it easy for staff to operate phones without having to wade through layers of unnecessary features. All internal calls routed through the Baby Bells IP switching facility are charged at a flat-rate. Choose from a variety of Baby Bell Service Plans and options to match your company's telecom requirements perfectly. Our switching facility houses the resources for nearly any voice- messaging requirement. From simple voice mail calls, to complex voice mail compression and e-mail forwarding, Baby Bell provides a scalable voice messaging solution. Access to our switching facility where your voice messaging system is maintained can be performed via the IP Phone+, IP SoftPhone or IP SLA. 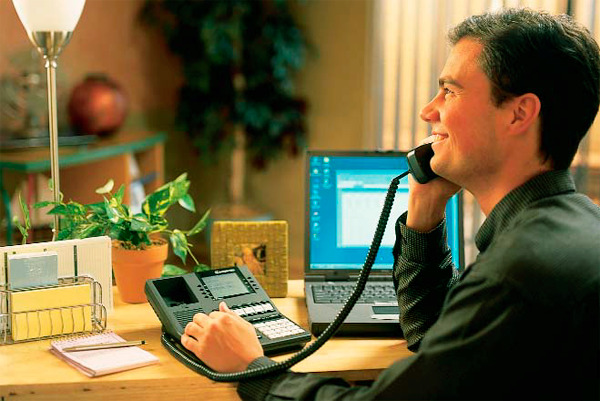 For organizations that require more robust call recording or call accounting, we offer optional services that provide comprehensive call recording, retrieval, and accounting of all voice/data traffic through the Baby Bell. Keeping your data secure is of primary concern. All Baby Bell IP traffic is encrypted using Inter-Tel proprietary encoding technology, and our switching facility is maintained in a highly restricted environment monitored 24-hours a day. The Baby Bell system is simple to use but we recognize the need for training with any high-tech device may exist. That's why we provide on-site training upon request at the completion of installation. Additional user support is also available through our Web site.